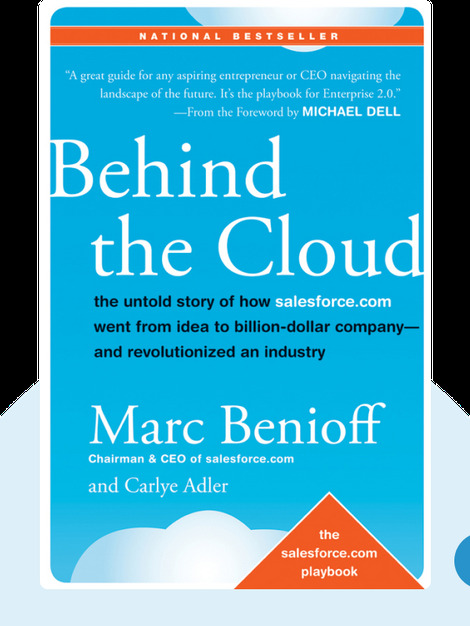 Behind the Cloud (2009) details the rise of Salesforce.com from a one-room apartment start-up to a prosperous global company. Using often unconventional methods, Marc Benioff – the founder and CEO of Salesforce.com – steered his company through financial problems and the dot-com bubble burst, and came out on top. Marc Benioff is the co-founder, chairman and CEO of Salesforce.com. He has written three books on business and is currently a board member of Cisco Systems. He’s also a committed philanthropist who’s donated hundreds of millions of dollars to good causes. Carlye Adler is an award-winning journalist and a bestselling writer. She has been published in Newsweek, TIME and Wired and has co-authored many successful business and leadership books such as The Promise of a Pencil with Adam Braun and The Hard Thing about Hard Things with Ben Horowitz. 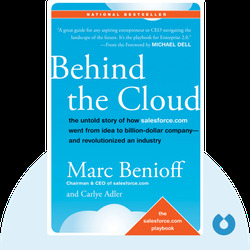 © Marc Benioff, Carlye Adler: Behind the Cloud copyright 2009, John Wiley & Sons Inc. Used by permission of John Wiley & Sons Inc. and shall not be made available to any unauthorized third parties.